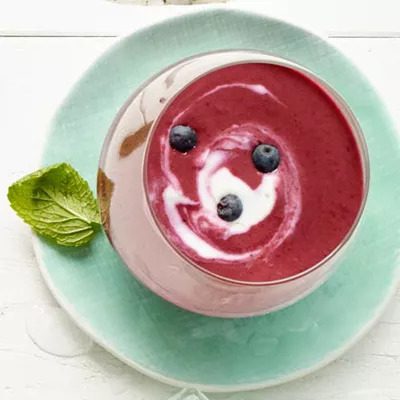 We bet you've never tried a soup like this berrylicious one before. It combines six zesty and sweet ingredients to create a delicious chilled soup. When was the last time you used honey in soup? Here it's the perfect complement to Greek yogurt, which gives the soup its consistency. The recipe also has a tangy flavor from lime zest and juice. This 300-calorie soup is simple to make, with just 5 minutes of prep time and 7 minutes of cooking. The hard work is letting it sit in the fridge to chill (about two hours)... But don't touch it. It's worth the wait. Ingredients: blueberries, honey, cinnamon, Greek yogurt, lime zest and juice, sugar.